Convert purchased or rental iTunes M4V videos to MOV, MP4 videos, Audio MP3 on Windows. • Remove DRM from iTunes M4V rentals and purchases. • Convert DRM M4V to MP4, MOV, AVI, FLV, MPEG, etc. • Support M4V to M4P/MOV at 20X conversion speed. • Retain all audio tracks like 5.1 surround sound. • Keep multi-language subtitles of iTunes M4V. • Provide batch conversion; simple interface. • Perfectly compatible with iTunes 12.9. Note: iTunes M4V Converter Plus Windows is a home edition and it's only for personal use. 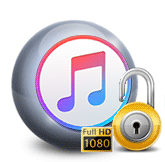 Remove DRM protection from iTunes M4V purchased or rented videos (support iTunes 12.9 perfectly). Convert iTunes M4V to the desired format like MP4, AVI, WMV, MOV, MPEG-I, MPEG-II, etc. So to play the M4V video on your regular players without iOS restriction. Clean DRM without defeating the DRM copy-protection technology used by your M4V files. This means it will function with all copy-protection measures which is completely legal. The new update of iTunes M4V Converter Plus Windows provides 20X faster speed to convert iTunes DRM-protected M4V videos with advanced acceleration technology. Choose "Same as Source for MP4"/"Same as Source for MOV" for enjoying output file with lossless quality. Besides, all audio tracks like AC3 Dolby 5.1 audio, and subtitles would be preserved perfectly. No need to worry about getting a lossy output file at 20X conversion speed. Get rid of the iTunes M4V protection and convert M4V video file, including 1080p HD and 720p SD movies, TV shows and music videos, to any video formats like MP4, AVI, MOV, MPEG-I, MPEG-II, 3GP, 3GP2, FLV, etc. Extract audio from iTunes M4V movies to audio formats like MP3, OGG, AAC, WMA, etc. Retain all audio tracks and keep multi-language subtitles. Remove DRM from iTunes M4Vs to play on regular players like iPhone XS/ XS Max/ XR, iPhone X, Samsung Galaxy Note 9, Nexus 6/9, Galaxy S10, Huawei P30, Sony PS4, Xbox One, and more. Media Streamer like Roku 3, Chromecast, Nexus Player and TV Console like Apple TV, Samsung TV, LG TV, Sony TV and Panasonic TV. Supports batch conversion to import several M4V videos into the program, and then convert them all to a single selected format. The converted files will be saved to a pre-selected directory folder and the original files will remain untouched. Conversion runs effortlessly and virtually in no time. The output quality is the same as the original iTunes HD or SD M4V movies, TV shows and other videos.